This blog post will not contain spoilers beyond the identities of the main cast and a basic outline of the premise of the story all of which is already public knowledge. If you want to go into the first episode knowing absolutely nothing about the story, do not read on. 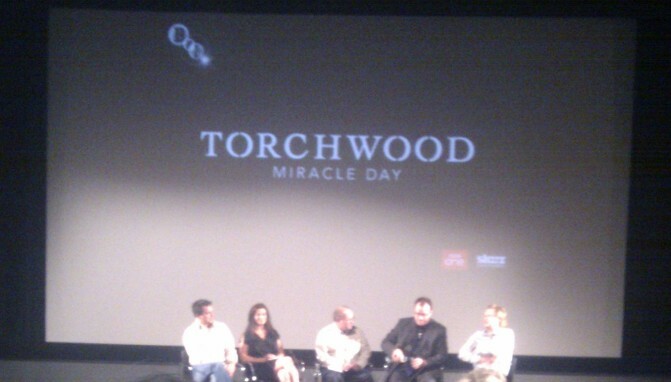 A few weeks ago, I was on my way home from work when I saw a tweet from the Doctor Who News Page that there was to be a special preview of the first episode of the new series of Torchwood at the British Film Institute (BFI) cinema on London’s Southbank. I tried desperately to book on my phone but the BFI’s booking system disagreed with my HTC Desire’s browser so I had to wait till I got home 15 minutes later. Fortunately there were a handful of single seats left, though they were swiftly disappearing, and I managed to book myself a seat in the middle of the cinema in the third row from the back. Fast forward to today and the date of the showing had arrived. I escaped from the rain and took my seat in the National Film Theatre to enjoy the show. After a quick introduction from a man from the BFI the guests of honour were introduced. 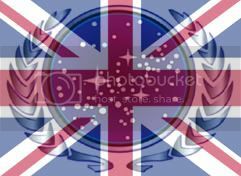 Attending the showing were stars John Barrowman, Eve Myles, Bill Pullman, Kai Owen and Tom Price as well as producers Russell T Davies and Julie Gardener. Then, after the standard warning about not posting spoilers on the internet or videoing the performance, we got underway. We get straight down to business with the premise of the series being presented very early on. Suddenly, no one in the world can die. Not that they’re indestructible, they can be injured, but they just don’t die. At the same time, the CIA find mentions of Torchwood and they try to find out more about it. Gradually, the old Torchwood crew are re-introduced with Jack’s entrance particularly well done. Action in this episode takes place on both sides of the Atlantic and there is plenty of it. Despite taking time to introduce the characters and concept to new viewers, there’s lots of action to get excited about just in this one episode. Gwen especially gets some awesome moments. The action sequences are where the increase in budget from American investment is most clear. There’s some really cool stuff they just couldn’t have done without that extra cash. The episode was a great ride. Lots of humour balancing nicely with the seriousness of the main story lines. The balance was also right between the info for the new viewers and jokes for long-standing fans. There are a few Wales jokes that I imagine will go right over the heads of the majority of Starz’s audience. The acting was great as always and Murray Gold’s cinematic score really suited the large scale of the episode. The evening finished off with a Q&A with Barrowman, Myles, Pullman and Davies with lots of great anecdotes, far too many to share here, but one of the highlights was a hilarious story about Barrowman hiding in the shower in Myles’ trailer and scaring her half to death. I had a great evening and can’t wait to see what’s coming up in the next 9 episodes. I’d encourage both current fans and newcomers to give it a go. TORCHWOOD: MIRACLE DAY premiers on Starz in the USA on 8th July and on SPACE in Canada on and UKTV in Australia on 9th July. BBC1 has yet to set a premier date for the UK but it’s expected to be around the same time in early July.